Attention has so far been directed to the culture of tropical and sub-tropical species of shrimps, and the so-called giant fresh-water prawn, Macrobrachium rosenbergii. Attention has so far been directed to the culture of tropical and sub-tropical species of shrimps, and the so-called giant fresh-water prawn, Macrobrachium rosenbergii. 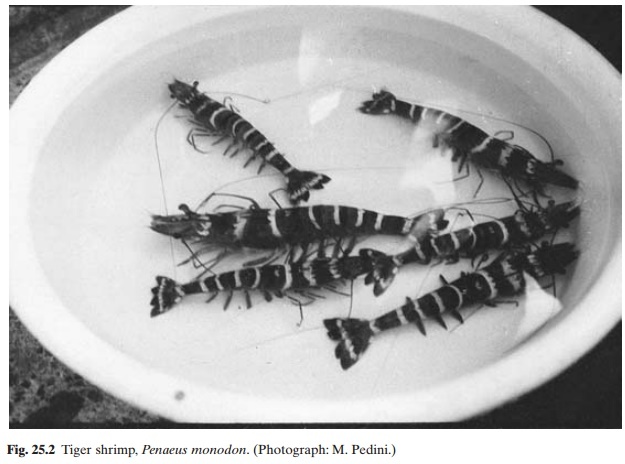 Spawning and larval rearing of the kuruma shrimp in captivity in Japan in the 1950s aroused considerable interest in intensive farming of shrimps and this species became the focus of attention for a number of years. It was introduced in many countries in Asia, southern Europe, West Africa, the southern USA and Central and South America. Very soon, attention turned to some of the larger local species of shrimps, which were better adapted to prevailing temperature conditions, and the larvae and juveniles of which were readily available to supplement inadequate production from hatcheries. In Asia, the more important species are the tiger shrimp P. monodon and the Indian or white shrimp P. indicus. The banana shrimp P.merguiensis, the green tiger or bear shrimp P. semisulcatus and the oriental shrimp P. orientalis (= chinensis) are also of commercial interest in some countries of the region. The redtailed shrimp P. penicillatus is a species cultured in Taiwan. Metapenaeus monoceros, M.brevicornis and M. ensis form subsidiary speciesin shrimp farms in several Asian countries. Besides the imported P. japonicus, the main interest in the Mediterranean countries of Europe has been in the local Mediterranean shrimp (triple-grooved shrimp) P. kerathurus. Present efforts in establishing shrimp farming in Africa have mainly involved the culture of P. indicus on the East Coast and P. notialis onthe West Coast. The most important species in Central and South America are the white-leg shrimp or camaron langostino P. vannamei and the blue shrimp P. stylirostris. Besides the blue shrimp, there are at least four species that have reached commercial-level culture in the countries bordering the Atlantic Coast of Central and South America, namely the brown shrimp P. aztecus, pink shrimp P. duorarum and P. setiferus, known as the common or whiteshrimp. As well as these, production on an experimental scale has been undertaken for the southern white shrimp P. schmitti. Though all the above species are of potential importance in commercial shrimp farming, and several others are being investigated for their suitability, the bulk of the present production comes from P. monodon, P. chinensis, P. vannamei, P. merguiensis, P. japonicus and P. indicus. Production estimates for crustaceans for the year 2000 totalled 1.647 million tons. Production of P. monodon was the highest (571000 tons), followed P. chinensis (219000 tons) and P. vannamei (144000 tons) (see Table 25.1). Much of the research effort on shrimp culture has been concentrated on the development of hatchery techniques for controlled spawning and larval rearing, as in the case of other marine aquaculture species. In the early years of investigations, considerable problems were faced in rearing and feeding the hatchlings through the different stages of development and obtaining reasonable survival rates. The search for species that may be easier to reproduce and have a shorter larval history resulted in investigations on the giant fresh-water prawn, Macrobrachium rosenbergii. The success achieved in the mass production of post-larvae of this species in the 1970s led to widespread interest in its culture, and it has been imported into an impressive number of countries in the tropical, sub-tropical and even temperate climates, in almost every continent. World production of M. rosenbergii increased from 26588 tons in 1991 to 118501 tons in 2000 (FAO, 2002). China, which is the world’s lead producer now, produced 97420 tons in 2000, accounting for 8 per cent of would production. But China began freshwater prawn culture only in 1996, even though Taiwan(China) with a production of 16196 tons was the lead producer in 1991. Thailand is the other major player in prawn culture but its annual production, which peaked at 10305 tons in 1992, had come down to 3700 tons in 2000, apparently owing to the Thai preference for marine shrimp farming, which is due in part to the easier technology in breeding and rearing and consumer preference for the shrimp. The oriental river prawn (M. nipponense), though small in size (8–9cm), is being cultured extensively in China as it can stand the winter temperatures and can be bred exclusively in freshwater, unlike M. rosenbergii. The estimate of annual farmed production of M. nipponense in China was 15000 tons in 1998 (Wang and Qianhong, 1999). M. nipponense is more popular particularly in Jiangsu province where about 40000ha were under production. The production of M. nipponense has increased further recently (Kutty et al., 2000). In addition to M. nipponense, which is now under substantial commercial culture, the most serious contenders for reaching commercial status are M. malcolmsonii in the Indian sub-continent, Cinnamon river prawn (M. acanthu-rus) and M. carcinus in Central America, and M. amazonicum in South America (Kanaujia et al., 1997; Herman et al., 1999; Kutty et al.,2000). salinity, the production of a species preferring low salinity can be alternated with one that requires high-salinity water. The short duration of culture periods makes such rotation very feasible in many areas. source, as performed by operators of small back-yard hatcheries in Thailand, or by the use of artificial sea water as in a commercial farm in Zimbabwe. The adults are omnivorous and feed on a variety of foods of animal and vegetable origin. originated with intensive studies on P. japonicus. It is a hardy species, but cannot tolerate lowsalinity or high temperatures. It requires diets containing about 60 per cent protein for satisfactory growth and grow-out ponds or tanks should have a sandy bottom. The tiger shrimp P. monodon (fig. 25.2), is the fastest growing species used in aquaculture in Asia. The species is euryhaline and can tolerate almost fresh-water conditions, even though 10–25ppt is considered optimum. It cannot tolerate temperatures below 12°C and the upper limit of tolerance is around 37.5°C. Penaeus indicus and P. merguiensis (figs 25.3and 25.4) have very similar habits in many respects, but in aquaculture the former species exhibits a preference for sandy substrates and the latter for muddy ones. Both species require high salinities (20–30ppt) for good growth and cannot tolerate salinities outside the range 5– 40ppt. The lethal temperature is above 34°C. Under the current pond management systems, the duration of culture cannot exceed three months, as heavy mortalities occur after that period. The three Metapenaeid species, M. monoceros, M. brevicornis and M. ensis, are easier toculture, as they mature readily in captivity and their larval culture presents fewer problems. Metapenaeus monoceros and M. brevicornis areknown to breed in ponds. They are tolerant of low salinities and high temperatures and can therefore be cultured in a wider variety of sites. Harvestable size is attained in a shorter time of two to three months, and survival rates are high. But their final size is smaller, generally about 14cm for M. monoceros and M. ensis and 7.5– 12.5cm for M. brevicornis. low. Among the shrimps cultured in Central and South America, P. vannamei (fig. 25.6) is highly euryhaline and can withstand salinities ranging from 0 to 50ppt and temperatures ranging from 22 to 32°C. Low salinities and warmer temperatures are characteristic of the rainy season (December to April) in countries like Ecuador and higher salinities and cooler temperatures prevail during the remaining months. This partly accounts for the higher survival rate of P. vannamei compared to P.stylirostris, and its preference in pond farmingin these countries.